Tue, Oct 23, 2018, 08:30 pm SL Time, ColomboPage News Desk, Sri Lanka. 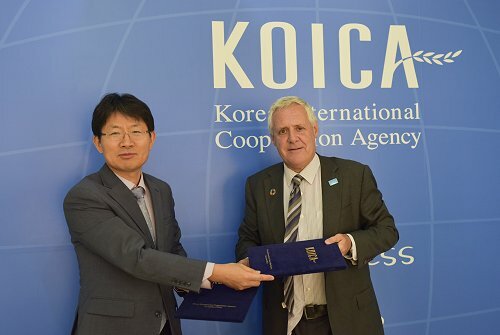 Oct 23, Colombo: The Korean International Cooperation Agency (KOICA) has signed a new multi-year partnership with the United Nations Children's Fund (UNICEF), to support education projects in the Kilinochchi district of Sri Lanka. The Country Director of KOICA Sri Lanka Office, Dong Ku Lee and the Representative of UNICEF Sri Lanka Tim Sutton attended the signing ceremony held at the KOICA office in Colombo. A funding grant of over US$ 6 million will be used to strengthen access to quality education in 13 schools, serving over five thousand children in the next four years. The 'Educational Environment Improvement Project in the Kilinochchi District' seeks to improve the quality of education and tackle inequity through the construction and renovation of class rooms, the promotion of ICT learning and teacher training. Promoting a more child-centered and inclusive education approach that facilitates every student, including those with disabilities and learning difficulties, to reach their maximum learning potential will be a key objective of this project. In 2017, only 57 per cent of children who sat for the Ordinary Level (O/L) exam qualified to proceed to the Advanced Level (A/L) upper secondary education stream compared with 71 percent island wide. Furthermore, Kilinochchi was ranked the last district in O/L results in both 2016 and 2017. "To ensure inclusive and equal quality education for all is one of the core values of the SDGs. Through this project, in partnership with UNICEF, KOICA will devote to the improvement of the educational environment in Kilinochchi through human resource capacity building and infrastructure improvements," Country Director, KOICA Sri Lanka Lee Dong Ku said on the occasion. Speaking at the event, Tim Sutton, Representative, UNICEF Sri Lanka said: "Reaching the most vulnerable children is critical if we are to ensure that every child in Sri Lanka has the opportunity to learn and grow to their full potential. This new KOICA-UNICEF partnership will help to ensure that children in Kilinochchi district have the same learning and education opportunities as those in other parts of the country. UNICEF thanks KOICA for its continuing support and commitment to children in Sri Lanka." This vital support builds on Korea's earlier collaborations with UNICEF, where nearly US$ 7 million was invested in school construction and quality education initiatives in the North and East since 2011. The KOICA-UNICEF partnership contributes to the Government of Sri Lanka's 'Vision 2025' strategic plan, related to economic and social infrastructure and the Education Sector Development Framework.